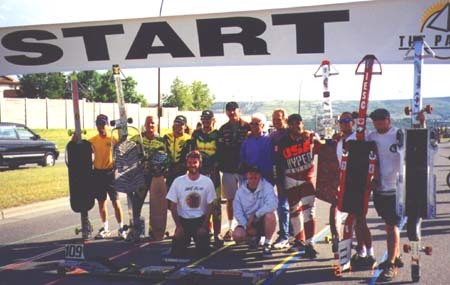 At the Start. The field consisted of 3 Canadian and 7 American riders. I had more runs than any other single weekend (25). 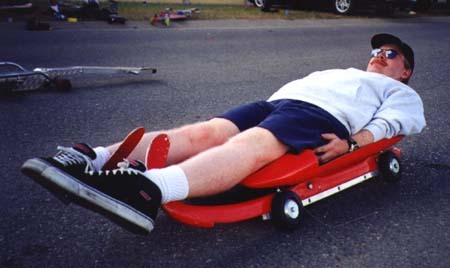 This is the road version of an ice luge sled (I usually don't use the word sled to describe a luge board but somehow the term fits this device). I didn't go down the hill but those that did said it handled VERY well. Members of the Canadian Ice luge team let us go down their track a few times. Speeds were 30 mph or so. I want to go back to Canada just to do this again. The Olympic flame was lit at the start of the 1988 winter Olympics. 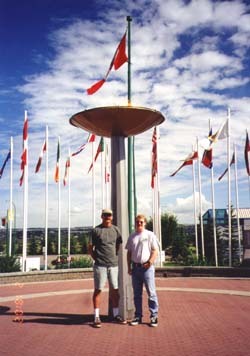 Steve and I hung around Calgary after the ice luging and visited the rest of the Olympic park. The place was very interesting. 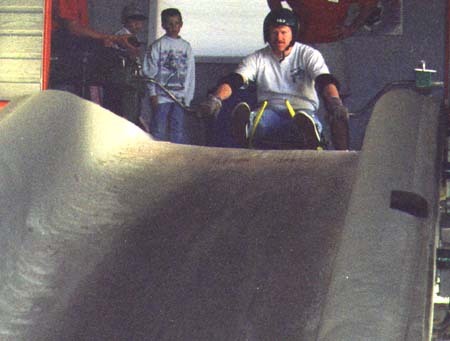 They have a version of the bob sled that lets 15 or so riders go from the top of the ice course. The thing must be screaming by the time it hits the bottom.